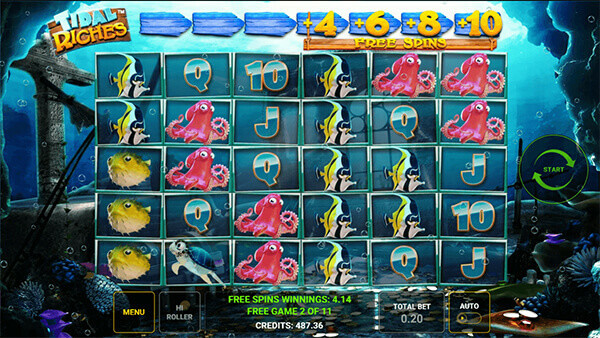 Tidal Riches is a new video slot all about the beauty of the vast ocean depths. Players will have to take a deep dive to find the various types of fish that swim around this area. Hang around for a while, and you will be able to follow them deeper, where all the Tidal Riches lie. We love the expanding reels this game gives us (quite different from the common Novomatic slots look & feel). As you spin more and chain wins together, more of the playing field activates, until you switch from a 5-reel, 3-row board to a 6-reel, 5-row playing field. The number of paylines also increases from 20 to 40 and then 50. Available special features include reel drops, expanding reels, free spins and Hi-roller bonuses. So, if you are ready to dive deep and look for treasure, we should not waste any more time. Put on your diving suit, and get ready to sink into the Greentube’s sea of fun and profit. We love this title’s graphics. There are so many little details included that show love and effort was put into Tidal Riches. As the board expands, a sleeping octopus will pull back some seagrass to make room for the extra reel. When the sea animals form a winning combination, they will sometimes escape the tile and swim away. And every few seconds, you see groups of fish swimming in the background, making the seafloor feel alive. Having multiple special features is great. Having several bonuses that interact with each other pushes it into the next tier – from great to amazing! Reel drops allow for several wins to be granted from a single spin, which increases the arrow trail. The arrow trail then expands the reels and activates free spins. And the arrow trail is even relevant after the bonus is already activated. The RTP for Tidal Riches is 96%, which is the current industry average, 1% below Novomatic’s Colombus slot. We cannot really think of any good reason as to why you should not be playing this slot right now. Unless you actively dislike some of the mechanics we listed, there are no excuses to skip Tidal Riches. As we already mentioned, the bonuses in this game are interconnected, each building on the previous. So we will start with the most basic special feature, and work up from there. This is Greentube’s version of the cascading reels system (similar to what you’ve might seen in Extra Chilli, Microgaming Tarzan and many others). When a winning combination is formed, the symbols explode, and new ones drop into view to take their place. This continues until no new wins are in view. Each winning drop increases the arrow trail by one. So, what’s the arrow trail, you might ask? The Treasure Chest only appears during free spins. They work like mystery symbols, revealing matching icons in all positions on the reel once opened. A new arrow trail is used during free spins. The fourth, fifth, sixth and seventh arrows grant additional free spins if you can reach them. There are seven total arrows. The first three expand the playing field, while the latter four grant free spins bonuses. One arrow expands the board to 6 reels and 3 rows with 20 paylines paying both ways. Two arrows expand the playing field to 6 reels and 4 rows with 40 paylines paying both ways. Three arrows expand the board to 6 reels and 5 rows with 50 paylines paying both ways. Four arrows reward 5 free spins and add the Treasure Chest symbol. Five arrows grant the stacked Treasure Chest to free spins. Six arrows add the Mega (2×2) Treasure Chest icon to free spins. Seven arrows add the Colossal (3×2) Treasure Chest symbol to free spins. We really have nothing to say that we did not already cover in our review. 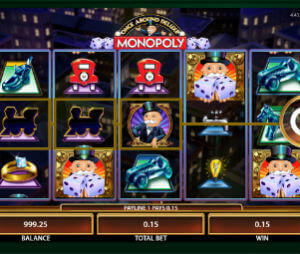 Amazing graphics, fun gameplay and lucrative jackpots all come together to create a perfect storm. Tidal Riches may be the Greentube’s crowning jewel and we warmly recommend it to everyone.